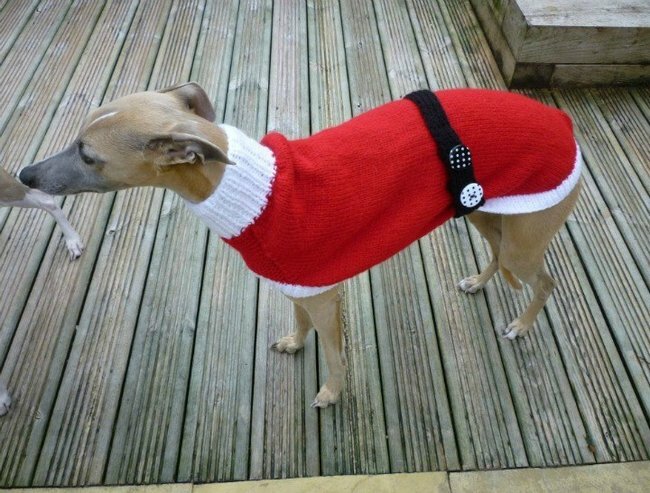 Jan Brown makes knitted jumpers for dogs that are homeless. 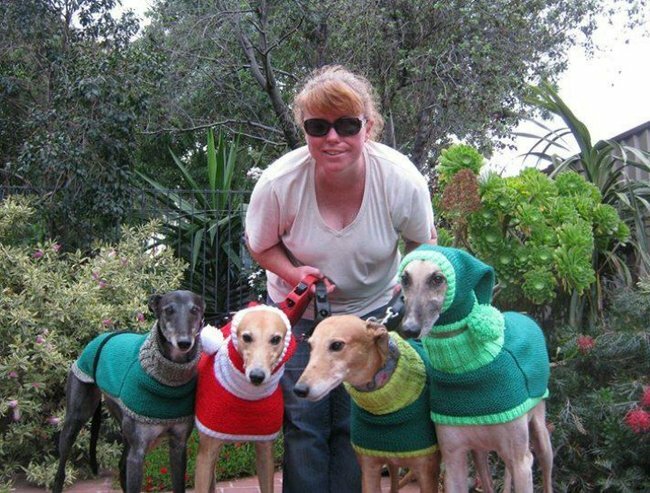 Someone is knitting snoods for homeless greyhounds. It's pretty flipping cute. Jan Brown (AKA Knitty Jan) is a very special lady. 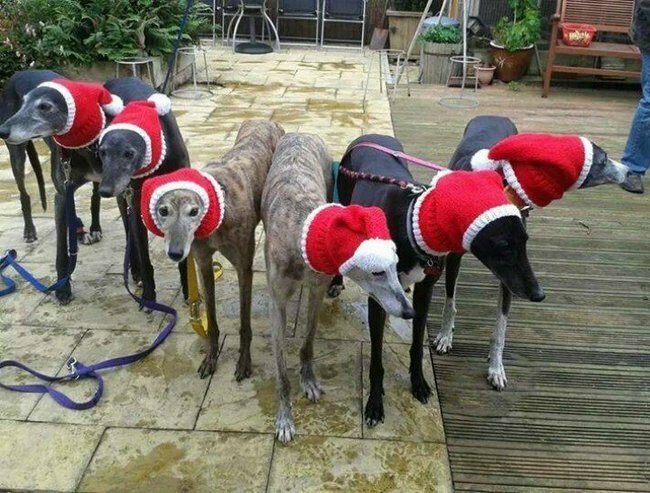 Five years ago, the 52-year-old mum from Sunderland, UK started knitting jumpers, hats and snoods for her local rescue shelter, Greyhound Rescue Northeast, in the town of Tyne and Wear. The centre rescues and re-homes greyhounds and whippets that have retired from racing. 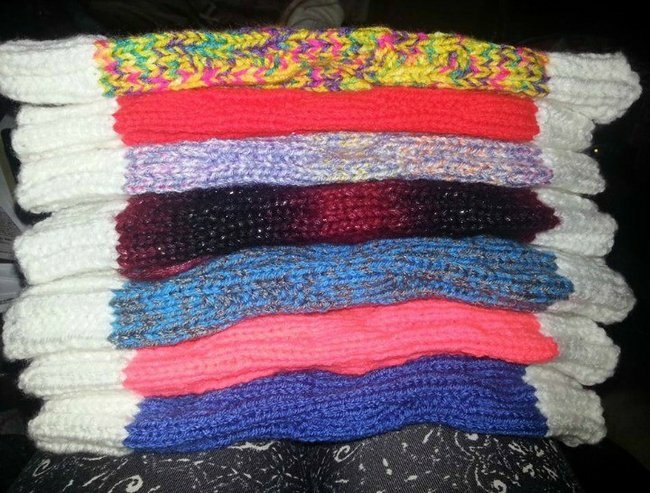 Metro reports that since she began, Jan has made over 300 jumpers for abandoned pooches, each one taking up to 20 hours to create. The demand (and workload) became so great, that in 2012, Jan quit her job to dedicate herself to the task full-time to her charitable endeavors. She now sells her creations on her website Knitted With Love. All proceeds generated from items sold go straight back into the woolies that Jan donates to shelters. But Jan takes things to a whole new level this time of year. Metro reports Jans repetoire expands to include reindeer antlers, Santa hats and elf jumpers. “It’s really sweet seeing them in their festive Christmas jumpers and it’s giving much needed help to the rescue centres,” said Jan. The reason Jan chooses to donate to Greyhound shelters is because of the breed’s thin fur and lean bodies. “My gifts help keep them warm during walks” she says. Now if that’s not Christmas spirit, I don’t know what is.